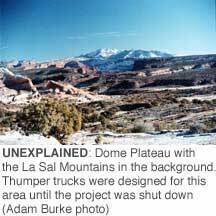 UNEXPLORED: Dome Plateau with the La Sal Mountains in thebackground. Thumper trucks were designed for this area until theproject was shut down. DOME PLATEAU, Utah - Thumper trucks have been rolling over this rugged chunk of public land a few miles from Arches National Park for only a few days, but already, they have taken on an ominous heft. News articles in Western and national newspapers have drawn attention to the machines. More than once, stories have told of "thumper trucks, pounding the earth in a seismic search for oil deposits ..."
Writer Terry Tempest Williams, an ardent defender of Utah's redrock desert, penned an essay for the New York Times that characterized the trucks as "giant mechanical insects." "At the time, the Bush energy plan was at best an abstraction and at worst a secret," Tempest Williams said later. "I wanted to give the American public a picture of what was happening on the ground in Utah." It's early February, and I'm heading south off Interstate 70, near Cisco, Utah, in search of the thumpers, which have, deservedly or not, become a symbol of the Bush energy policy in the Intermountain West. A helicopter passes over head, with a basket cabled to its belly: seismic gear moving from a central staging area to crews working somewhere on this 36-square-mile area. Soon I see truck treads unfurl off the road alongside pink flagging and something like a long extension cord. 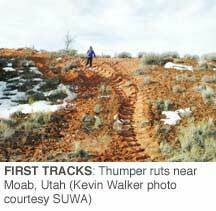 The trucks have rolled over many things: soft, lumpy soil; rocks, bunch grasses, blackbrush, even a few juniper trees. But when I find them, they are temporarily stuck down in the nearest drainage. The lead driver makes several charges up a steep incline, giant tires chewing the embankment. The engine roar is deafening. They finally make it out of the draw, and I get a closer look: They are segmented like insects; the center section, a tangle of hydraulic pipes and pistons, bears a steel plate the size of a card table. With a shudder and belch of exhaust, the trucks slowly drop their plates to the earth in unison. A low bass tone is barely audible above the engine noise. Tiny grains of sand and dust dance and skitter across the soil surface, like ants swarming out of the ground. This scene is repeated hundreds of times over the next several days on Dome Plateau, while more headlines break across the national news about the Bush administration's push for more oil and gas development on public lands. 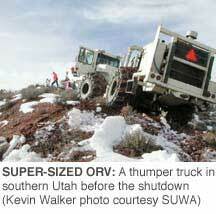 A little research reveals that these trucks won't reduce Utah's signature sandstone arches to rubbled dust. But there's no denying that the backlash they provoke at Dome Plateau foreshadows an escalating war over energy development in the Intermountain West. But first things first: The 40,000-pound trucks don't thump. They don't "pound the earth," as news stories continue to report, and are actually much more precise and gentle than old-school exploration. They have to be. The days of striking large fields of black gold by accident are long gone. Only smaller, unproven reserves remain on public lands. Known in the industry as "vibroseis vehicles," the trucks move in a straight line across miles of terrain, stopping in 220-foot increments to send sound waves into the ground. The waves rebound off various geologic features below the earth's surface, and then are picked up by arrays of sensors or "geophones" inserted into the ground. The sound is conveyed via miles of cables and battery packs to a central recording bank. The result is a highly detailed picture that can show an area as large as 300 square miles, and thousands of feet deep. Industry officials say modern seismic exploration actually increases environmental protection. These trucks, which have been in use for decades, allow oil and gas developers to drill with surgical precision, greatly reducing the number of exploratory wells. The balloon tires and articulated midsection make cross-country travel easy and road building unnecessary. "Most companies have equipped them with very large tires that spread out the weight so that in terms of actual pounds per square inch there's no more than an average vehicle," says Stuart Wright, a geophysicist for Western GeCo, the energy contractor exploring at Dome Plateau. "It's our contention that any impact is minimal and ephemeral. It tends to heal itself rather quickly. But if you don't want to take our word for it, you can go out there and judge for yourself." Such light-footed mobility has led industry and the Bureau of Land Management to view the thumper trucks as a relatively minor intrusion. On Dome Plateau, the agency's decision to permit Western GeCo to conduct seismic work concluded that the project would "not result in any undue and unnecessary environmental degradation." But several other agencies raised concerns, especially about soil disturbance, which, in the desert, can lead quickly to wind and water erosion. Letters from the U.S. Geological Survey, the U.S. Fish and Wildlife Service, and the Environmental Protection Agency all said the BLM's draft environmental assessment was lacking. Jayne Belnap, a soil scientist with USGS's Moab office, took issue with the BLM's suggestion that soil and vegetation would recover in three to five years. "Recovery of soil compaction, biological soil crusts, and most desert shrubs (in this desert system) is on the order of at least multiple decades," Belnap wrote. These letters, in counterpoint to internal BLM memos, raised the hackles of the Southern Utah Wilderness Alliance (SUWA), which claimed that the BLM was favoring energy development at the expense of environmental protection and public input. The group circulated an August 2001 memo from BLM's Utah office that instructs Utah field offices make drilling and leasing their "No. 1 priority." But Maggie Wyatt, manager of the BLM's Moab Field Office, says she wasn't pressured to go ahead with the project. "These are lands that have been leased for over five years," says Wyatt. "It's not BLM policy that dictates whether a company decides to explore or drill. It's market prices."